This pane shows the hierarchical tree structure of the bookmarks collection. Folders can be expanded to show their contents (more folders only). Selecting a particular folder displays the contents (including bookmarks) in the Bookmarks & Folders pane to the right. 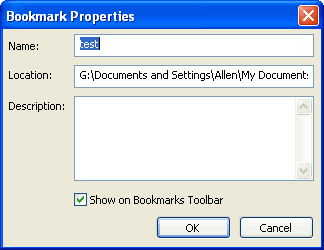 The folder Bookmarks is the parent (or root) folder of all subfolders or bookmarks. This pane displays the contents of a selected folder in the Folders tree to the left. In addition to the bookmark or folder’s name, it’s location and any comment (Description) are displayed. The three columns may be resized (by dragging the edges of the column headers), but not dragged into a different order. Double-clicking on a bookmark ( ) transfers the current tab to that location, ie. goes to the bookmark, while double-clicking on a folder ( ) opens that folder and displays its contents. Each bookmark item in this pane has a context (ie. 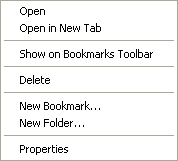 right-click) menu which is quite similar to the context menu for items on the Bookmarks toolbar, with the addition of a Show on Bookmarks Toolbar item. The New Bookmark… and New Folder… items on this menu are not yet coded, ie. they are non-functional. These buttons move a selected bookmark (or folder) in the Bookmarks & Folders pane up or down in the bookmarks list. Only a single bookmark or folder may be selected at a time. This button deletes (with a confirmation dialog) a single bookmark or folder selected in the Bookmarks & Folders pane. Deleting a folder obviously deletes all the bookmarks and folders it contains. Deleting a folder does not update the Folders tree until the next opening of the Organize Bookmarks dialog. It is possible to create a new folder, then save the bookmark elsewhere or cancel saving the bookmark, thereby creating an empty folder. Attempting to subsequently delete an empty folder will cause a fatal crash. Workaround: Prior to deleting a folder, select it in the Folders tree to ensure that it is not empty. If necessary, add a dummy bookmark to the folder prior to deleting it. You edit the properties for any item selected in the Bookmarks & Folders pane. If the item is a folder, then the Location: field is absent.